Kony 2012, like every Invisible Children media campaign, offers many things I wish they would change. But its goal is not one of them. The film is touching and inspiring. 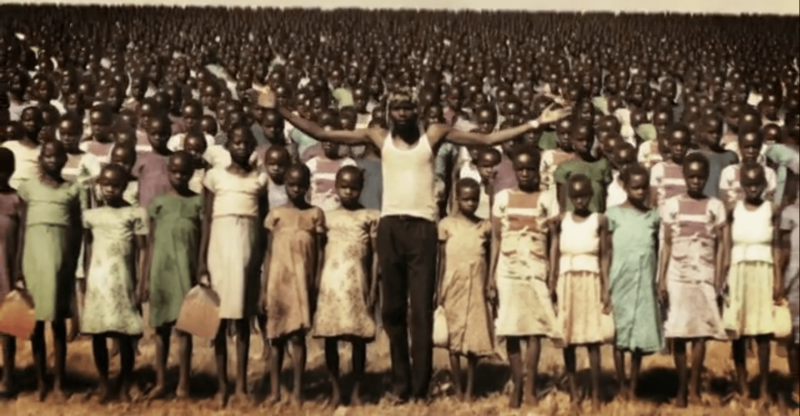 As an advocacy piece, however, it is flagrantly simplistic, verges on misleading (like when Joseph Kony is shown with legions of rendered children behind him [11:30], without mention that his current force is thought to number in the low hundreds of fighters), and masks the complete uncertainty of its mission behind a veneer of easy cause and effect: if we tweet and put up posters, the US advisors will keep helping the Ugandan military, and Kony will be captured—the simple steps shown onscreen as falling dominoes. This rosy reductionism contrasts sharply with a policy letter released with the film, to which Invisible Children are signatories, that asks President Obama for diplomatic help because, “Uganda withdrew more than half of the forces initially deployed to pursue LRA commanders and groups, and their forces are no longer allowed to operate in Congo, where the LRA is committing the majority of attacks on civilians.” No dominoes there. The films Invisible Children makes are not advocacy films at all, they are advocacy advertising, advocacy propaganda. They are simplistic and over-produced and pop-cultured because that is what we as Americans respond to. Invisible Children pioneered this space, a space where other advocacy organizations still fear to tread, because they want to reach Americans. Lots of them. And they are flogged for it every time they release a new film. How far they bend reality, and have bent it again with Kony 2012, is something about which I disagree with them. But whether we agree or not, it’s important to realize that their over-simplifications are not simple-minded, they are strategic. There is much more depth behind the scenes. The most important questions raised by this film, and the ones that seem least touched by thoughtful criticism, are whether the film’s goal of militarily stopping Joseph Kony is worthy, and whether Invisible Children’s plan to do so is a good one. To these I answer a deeply ambivalent ‘yes’. Kony and his forces continue to abduct and kill, and two decades of evidence show that they are unwilling to commit to a peaceful resolution. The sooner they are stopped, the fewer people in central Africa will die by their brutal hands. There are deep, important concerns here that go unmentioned by Invisible Children, like the Christmas Massacres of 2008, when the LRA retaliated after a failed, US-supported strike against them by slaughtering hundreds of innocent civilians. Nonetheless, it seems to me and to many informed observers, and importantly to villagers in the affected areas, that the military solution to Kony is the best of what are only bad remaining options. And although Invisible Children’s plan of building a US lobby for continued and increased US involvement far from guarantees a positive outcome, it is intelligent and thorough, and is currently, as far as I can see, the best chance to bring Kony’s terrors to an end. If you agree with the goal of militarily stopping Kony (however hesitantly), this is the next step. I wish Invisible Children would have offered viewers of their film a more complete, nuanced, and accurate look at the LRA conflict. But just as ends do not justify means, so means do not negate ends. The goal of stopping Kony is sound and Invisible Children’s plan is strong. I hope it works. In depth New Yorker article from the mid-nineties on Kony’s brutal tactics. Teju Cole on American sentimentality. Ugandan and other African voices on Kony 2012. Great piece. Your post expresses many of my concerns and inner conflicts, especially as people around me ask me what I think. Just because I have lived in Uganda for a short time does not mean I have answers. But, like you, do believe in the goal of IC’s Kony 2012 campaign, and the level of awareness it raises will hopefully sustain to something more than what I have heard it called the “meme du jour.” Thanks for talking about this and giving a more informed perspective to add to the conversation. Thanks John. In related news, I was talking to some friends here in Uganda and we think you’re due for a visit. Just saying. Hello James. Just a simple observation: When watching the movie I was’t at all misled to believe that Kony had a force of 30,000, but I merely saw that over the years he has abducted 30,000. Perhaps IC should make a Kony 2012 “B” movie (B for second, or B for boring maybe) as a factual follow-up since there is the charge of oversimplification and many critics swaying the public with their own tidbits of counter-information. As they say, a little information is a dangerous thing. Good point, Dave. The 30,000 number is an ongoing beef I have, not because it’s inaccurate. In fact, I think IC should use it. It’s a terribly important number. But I’ve almost never heard them temper it with current numbers. They sort of leave people with only that number in their heads, I think for effect. Tempering the message with current reality is not something IC excels at, and I’m strong on reality. Thanks for your response. If you haven’t read this (http://www.guardian.co.uk/world/2012/mar/14/kony-2012-screening-anger-northern-uganda?newsfeed=true) already, It highlights much of what I was concerned about and what I mentioned in my comment above. I think IC does a lot of things extremely well, and others not so well. We can say this about most NGO’s. Well written and thoughtful piece. Thank you. Interested in your thoughts of the t-shirts and posters to be plastered all over the world on the night of April 20th. I have lived and worked in Uganda for some time now and I understand the need to bring Kony to justice/the need for people to become informed and aware. However, I believe that much of IC’s approach is insensitive to those who have been effected by Kony and the LRA. I can’t imagine as an individual who suffered some of Kony/LRA’s terrible and senseless acts of violence, that it would feel good to wake up on April 21st to his face and name everywhere. If you have spent much time over there, then you his name is still very difficult for many Ugandans to speak. That pain is still very real- and while I believe in bringing awareness and attention to this, I think it critical to examine how this is being done. Good question Kelsey. I can definitely see your point. I wonder whether many posters, etc. will actually be up in northern Uganda or DRC/CAR/SS. I also wonder if, even after the fact, someone explained to me that the posters were a global effort to stop Kony, who I would certainly want stopped in this scenario, I might be supportive of them. What do you think? Dave, I heard that IC is planning to release a 10-min video responding to the areas of the film that could be considered misleading or ambiguous. It seems like it might fall in line with your great idea of creating “Kony 2012 B”. It seems like the video did a great job of starting conversations/debate around the world and really prompting individuals to reflect on what’s really going on in Uganda, DR Congo, etc. Well said James. I too agree with IC’s overall goal. Ilea and I always have. I never expect any one organization or individual to get all of the details correct. When you’re that close to the game, you’re bound to get lost in the details from time to time. What I care about is the consistency, willingness to listen and adapt, and the overall mission. And I’ve never doubted any of those aspects with IC. The fact that they have educated this many people as to the what is going on in that region (regardless of a few inaccuracies) is monumental in and of itself. And to the critics, I say, “so what exactly are you doing for the situation? And furthermore, how will this video hurt the situation?” Could it have been better? Sure. Would the situation be better off without the video? I doubt it. I have to believe it’s doing some serious good, regardless of it not being perfect. IC is trying; hard. Their heart is always in the right place. And they aren’t afraid to fail. They push because they care. The’ve produced some epic results over the years. And when they have a flop, they get back up and go for it again. I’m glad they are doing what they do. And I expect they’ll continue to get better and better at it over time, just like we’re striving to do. Thanks for your insight on this bro. I’ll be sending this out to all of the people asking me for my opinion on this issue. You already said it best right here. James, I meant to say this in my last post…thanks for your honest and thoughtful response. I still remember the “old days” in Gulu, wish we could grab a cigar and coca-cola over this. Likewise brother. Thanks for engaging. Hope to see you soon! I should be in Gulu sometime in the next couple weeks. I’ll give you a holler. Great post James! They talking about Kony2012 on WNYC today and Milton Allimadi (Black Star News) had some interesting thoughts on the endgame – differing (of course) from IC’s. Invisible Children is the illuminati! Secret society! One last comment… In the wake of this movie I’ve taken the opportunity to remind people of Ember Arts. I like this b/c it’s simple and it directly helps the people of uganda via these women. You found people in need and helped them in a true and lasting way. Taught them to fish instead of giving them some sushi. Thanks for writing this, James! Hope your business and life in Uganda are bulungi! Are you coming back to San Diego?